The Honour Roll commemorates those from Amherst and district who served in World War One. 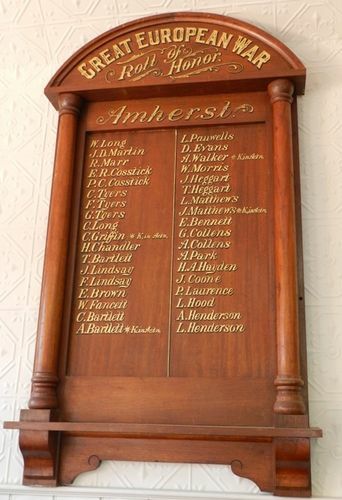 On the evening of the 28th September at the Town Hall, Amherst, a social was held, at which there was a very large attendance, the chief attraction being the unveiling of a roll of honor subscribed for by the residents. The roll, which contains the names of some 30 Amherst and district young men who had enlisted, is a very handsome one. Cr Walter E. Gane presided, and the unveiling ceremony was performed the Hon. A R. Outtrim, who commended the residents for having procured the roll, and highly eulogised the Australian soldiers. Rev. A. Coates also addressed the meeting, and songs were rendered by Mrs Philippi, Miss Martin, and Mr Saw, a duet by Mrs Buchan and Miss Martin, and recitations by Misses Davis Philippi. On the proposition of Mr G. Fisher, thanks were accorded the speakers, performers, and Miss Martin for presiding at the piano. At the conclusion refreshments were handed round. Talbot Leader (Vic), 6 October 1917.